The premier outdoor event of the year for visitors and exhibitors, an exceptionally successful event in beautiful surroundings. The management team at Burghley insist upon the very best of work and display standards, so the popularity of the event increases each year. We shall have our two pavilions, No. 1 pavilion and shedding with piazza and music, No. 2 pavilion adjacent to the now famous Food Walk, creating a friendly atmosphere in which to spend 4 days – altogether an event not to be missed. Caravans park in the Deer Leap caravan park as directed, a five minute walk away. Exceptional sales were reported last year; the spending power of these visitors is superb. PLEASE NOTE: Burghley do not allow exhibitors to have two stands on the showground. 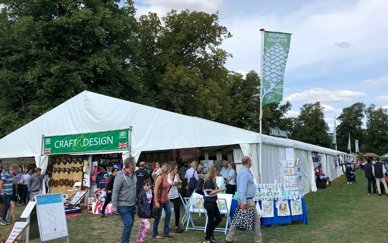 Food Walk: exhibitors – Please apply direct to Burghley. Caravan/Camping – we will send the booking forms (DLP) to you in July, please complete and return these to us as soon as possible as space is booked quickly.